The UMaine New Writing Series presents a reading by poets Dale Smith and Hoa Nguyen on Thursday, December 4, at 4:30pm in the Allen and Sally Fernald APPE space in 104 Stewart Commons. The reading will be followed by a Q&A with the authors. It is free and open to the public. Hoa Nguyen is the author of eight poetry books and chapbooks, including Red Juice: Poems 1998-2008 (Wave) and As Long As Trees Last (Wave). She lives in Toronto, Ontario where she teaches poetics at Ryerson University and curates a reading series. Dale Smith is the author of the recently published book of poetry, Slow Poetry in America (Cuneiform); and a book of scholarship, Poets Beyond the Barricade: Rhetoric, Citizenship, and Dissent after 1960 (Alabama). He is on the faculty of the department of English at Ryerson University, Toronto. Between 1998-2003, Nguyen and Smith edited the Austin-based independent poetry magazine and press Skanky Possum. The UMaine New Writing Series was founded in 1999 and is sponsored by the English Department and the National Poetry Foundation with support from the Office of the Executive Vice President for Academic Affairs and Provost, The Fiddlehead Fund, the Lloyd H. Elliott Fund, the Milton Ellis Memorial Fund, the Honors College, the University of Maine Humanities Center, and the Cultural Affairs/Distinguished Lecture Series Committee. Grateful acknowledgment is made to the IMRC, and to donors Allen and Sally Fernald, for use of the APPE Black Box space. The authors who appear in the NWS write for adult audiences and make use of a wide spectrum of language and subject matter. We are happy to advise parents and secondary school teachers on which events may not be suitable for their children or students: just contact the Series coordinator at steven dot evans at maine dot edu or at 207-581-3818 a few days in advance. 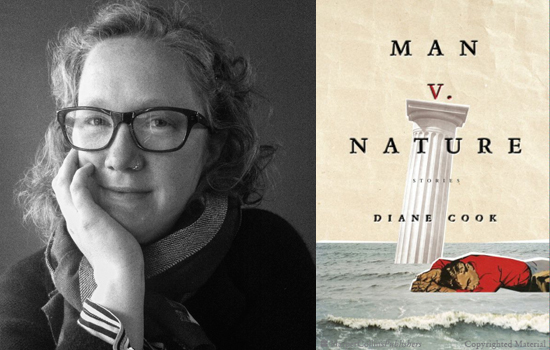 The UMaine New Writing Series presents a reading by Diane Cook, author most recently of Man V. Nature: Stories, on Thursday, November 20, at 4:30pm in the Allen and Sally Fernald APPE space in 104 Stewart Commons. The reading will be introduced by Gregory Howard and followed by a Q&A. It is free and open to the public. The New Writing Series presents a reading by Christopher Merkner on Thursday, November 13, at 4:30pm in the Allen and Sally Fernald APPE space in 104 Stewart Commons. The reading will be introduced by Gregory Howard and followed by a Q&A. It is free and open to the public. Christopher Merkner’s first book The Rise and Fall of the Scandamerican Domestic was published in 2014 by Coffee House Press. He teaches creative writing at West Chester University. His work has appeared in Black Warrior Review, Cincinnati Review, Fairy Tale Review, Gettysburg Review, New Orleans Review, and Best American Mystery Stories. This is his first appearance in the New Writing Series. The New Writing Series presents a reading by the poet Alice Notley on Thursday, November 6, at 4:30pm in the Allen and Sally Fernald APPE space in 104 Stewart Commons. The reading, which is co-sponsored by the Honors College, will be followed by a Q&A and is free and open to the general public. Notley first read in the New Writing Series in November 2001; she returned for a brief residency in November 2004. Don’t miss out on this rare opportunity to hear one of the defining voices of contemporary American poetry as she returns to Orono for the first time in ten years. Alice Notley has published over 25 books of poetry, including Culture of One (2011), Songs and Stories of the Ghouls (2011), Grave of Light: New and Selected Poems 1970-2005 (2006), awarded the Lenore Marhsall Poetry Prize; In the Pines (2007); Disobedience (2001), awarded the Griffin International Poetry Prize; Mysteries of a Small House (1998); The Descent of Alette (1996); and many more. With her sons Edmund and Anselm Berrigan, Notley edited The Selected Poems of Ted Berrigan (2011) and The Collected Poems of Ted Berrigan (2007). Notley has received the Los Angeles Times Book Award for Poetry, an Academy Award from the American Academy of Arts and Letters, and the Shelley Memorial Award from the Poetry Society of America. She has also been a finalist for the Pulitzer Prize. In November of 2011, Notley read in the University of Chicago’s “Poem Present” series; the event was introduced by Jennifer Scappettone (NWS S’14). In February of 2012, Notley spoke with Michelle Naka Pierce, director of the Jack Kerouac School of Disembodied Poetics, as part of her residency at Naropa University. Their conversation touches on Notley’s relationship to languages other than English (the French of the Paris where she now lives, the Spanish of her childhood in Needles). Just a few weeks ago, Eileen Myles (NWS S’10, S’01) delivered a keynote talk on Notley’s work at the Alette in Oakland conference organized by the Bay Area Public School. The three-day symposium was crowd-funded through an Indiegogo campaign.